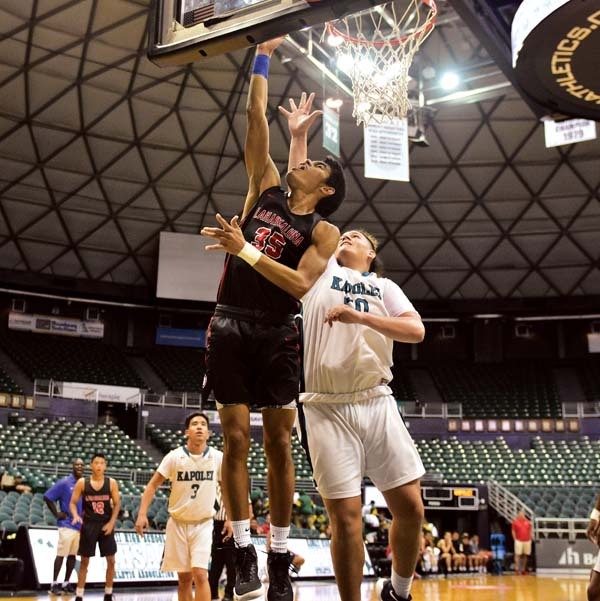 Isaiah Tanner had 15 points and Aukai Kama added 13 points — including the go-ahead 3-pointer — and 11 rebounds to help the Lahainaluna High School boys basketball team rally to beat Kapolei 57-55 in the fifth-place game of the Snapple Division I State Championship on Friday at the Stan Sheriff Center in Honolulu. The Lunas (16-1) trailed 34-25 late in the first half before going on an 11-2 run to tie it up with 4 minutes, 2 seconds remaining in the third quarter. The teams traded the lead a few times until Kama’s 3 put Lahainaluna ahead 51-49 with 1:52 to go. Kama added a layup and Iverson Turno went 4-for-4 from the free-throw line to seal the win. Reece Pascua had 10 points and Turno finished with seven points for the Lunas. Zoar Nedd had 18 points and Nathaniel Whiteshurst scored 11 for the Hurricanes (14-3). Reece Pascua 10, Iverson Turno 7, Cley Josef Palma 3, Aukai Kama 13, Koa Evalu-Robinson 7, Isaiah Tanner 15, Carter Stockham 0, Siale Hafoka 2. Isiah Higa 6, Nathaniel Whitehurst 11, Zoar Nedd 18, Kaimana Rodrigues 2, Julius Buelow 1, Hezekiah Del Prado 6, Kieran Queen-Booker 2, Jalen Miller 4, Kanoa Malano 5.